Welcome back to our Test Drive series, where we try a handful of brands in a category of natural products and compare the real-life results. 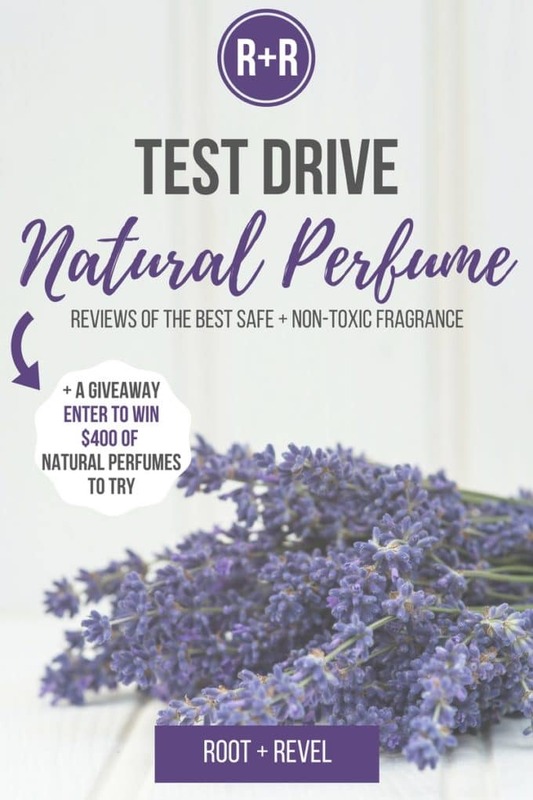 Today we’re taking natural perfume for a test drive! GIVEAWAY ALERT: SCROLL DOWN TO THE END TO ENTER TO WIN A NATURAL PERFUME GIFT SET VALUED AT NEARLY $400! You might remember a few weeks ago when we talked about the dangers of fragrance, that undisclosed mixture of chemicals that’s added to nearly every product on the market, and yet companies don’t have to tell you what’s in it. But did you know the average fragrance product contains 14 secret chemicals not listed on the label? That’s right, fragrance (which includes perfume and cologne) has been proven to cause headaches, allergies, asthma and respiratory distress; it negatively affects the brain, irritates the skin, harms the reproductive system and can even cause cancer. But it smells so good, doesn’t it!? I’m the first to admit that when switching over to non-toxic products, I missed perfume the most. So I was PSYCHED when I learned that there were a handful of brands out there making safe and natural perfumes and disclosing their full ingredients list! So you might be wondering what the difference is between synthetic fragrance and natural perfume. And fortunately, the answer couldn’t be simpler. Natural perfume contains aromatics derived from whole sources in the natural world such as roots, flowers, moss, seashells, and tree resins. Meaning if a natural fragrance is rose, it was made from an actual rose. Compare the to synthetic perfume, which contains aromatics derived from petrochemicals or GMOs (often harmful bacteria), and has no connection to its namesake; meaning when a synthetic fragrance claims to have a rose scent, a rose was likely was not involved in any way. Instead the scent is made from chemicals designed in a lab to mimic the qualities of natural aromas, which makes them last longer. And while everyone wants their perfume to last, when you consider the long degradation period the chemicals must go through in order to achieve this effect, you quickly realize the fragrance is penetrating your skin for long periods of time, being absorbed into your bloodstream, accumulating in your body and interfering with your system. AND synthetic perfume persists in the environment without breaking down for much longer than natural aromas. On the flip side, natural perfumes made with pure essential oils stimulate neurochemicals and hormones that balance and regulate the endocrine, immune and nervous system. That’s why sometimes, just the simple act of inhaling an essential oil with sedating or stimulating properties (hello lavender!) can immediately calm you down or make you relax or give you a burst of energy! Natural perfumes generally last about 4 to 6 hours when applied. Mist generously on pulse points, across arms, neck, décolleté, and in your hair to make them last longer and reapply as needed. Natural perfumes wear far more subtly than synthetic fragrances and are greatly influenced by the wearer’s body chemistry. So they’ll smell a little different on each person. Slight variations in color and aroma may occur due to seasonal variations of the natural ingredients, and in fact, natural perfume blends are usually an amber hue, so be careful about staining your clothes. There may also occasionally be traces of natural sediment from the oils visible in the bottles. Most natural perfumes mature over time, and can become richer to the senses, lasting up to 3 years. Avoid storing natural perfumes in extreme heat or cold and keep them away from direct sunlight and heat sources. At this point, you might be thinking: great, I’ll just make my own own natural perfume. Here’s my short answer: Don’t bother. Ha, while it is absolutely possible to make a natural perfume with an alcohol base, flowers and essential oils, all of the ones I’ve tried to make myself end up smelling more like cleaning products and last for only a few minutes. When you consider you’ll need more than essential oils (think hydrosols, concretes, absolutes, resins, etc. ), I simply don’t have the tools, resources or skills to make my own. So, here’s my advice (and this is totally just a matter of preference): buy one. I almost never suggest that option, but when it comes to natural perfume, I think you’ll get the best product and it’s just too difficult to make it right yourself. What is the best Natural Perfume? Thorn + Bloom Natural Perfume ($65 for 7.5 mL): This Massachusetts-based brand is a microperfumery, blending, bottling and boxing every perfume by hand with only two employees. Each of their Eau de Parfums are 100% natural and over 90% organic and made with cold-pressed hydro-steamed essential oils, pure concretes, absolutes, and CO2 extracts, wild-harvested resins, and triple-filtered USDA Certified Organic Grape Alcohol. These scents were rich, intoxicating, and incredibly floral. The Orange Blossom scent was my favorite–with notes of honey, orange blossom, patchouli, cedarwood and cardamom, it was light and uplifting, just my style. Strange Invisible Natural Perfume ($125 for 15 mL): These botanical fragrances blend certified organic, wildcrafted, biodynamic, and hydro-distilled essences to created an entirely natural perfume that’s designed, decanted (in a base of custom-distilled esprit de Cognac, and aged for a minimum of six months, no less), and bottled at their Venice, CA-based fragrance house. Synthetic aromas and animal essences are never used, and their luxury, sustainable packaging leaves nothing to be desired. I tried their Fair Verona, Peloponnesian and Essense of IX and found them all to be incredibly rich, nurturing and beautiful. I tend to lean more toward bright, crisp, cool scents (my synthetic fragrances of choice have been Dolce & Gabbana Light Blue and Jo Malone Sea Salt + Sage, if that gives you an indication of my scent preferences), so I found some of these aromas a bit too heavy. That being said, I was impressed with how strong the scents were–I expected natural perfumes to be more subtle, but these wear beautifully and definitely feel like you’re wearing perfume. Vered Organic Botanicals Natural Perfume ($98 for 15 mL): A proprietary blend of ethically sourced, wild-crafted and 100% certified organic essential oils, plant oils and herbs, Vered’s natural perfumes are all purely made in-house with the whole plant. There are no chemicals involved in their process from start to end, and all the plants are extracted in carrier oils that are cold-pressed and unrefined, without the use of solvents, hexane, or alcohol extractions. Like all of these scents, Vered’s natural perfumes are unisex, though the Signature Scent and Blue Violet (my favorite–it’s super green and earthy with a light floral undertone) are a bit more floral and feminine, while the Deep Citron is slightly more masculine with woodsy, smoky and citrusy notes (though I wore this one many times and loved the sultriness of it). Ime Natural Perfume ($60 for 30 mL): This Australian-based company is only available in the U.S. if you order online, but don’t let that stop you. With a background in natural therapies and together with a master perfumer, each natural fragrance has been created holistically with certain moods, muses and colors in mind. I found these scents to be the most similar to that of synthetic fragrance–which is actually a great thing. Some of the natural perfumes smelled more like essential oils to me, but I found Ime’s natural perfume to be lighter, less oily and more akin to what I was used to, despite the fact that each perfume uses only 100% natural ingredients from quality botanical sources, like flowers, grasses, herbs, spices, bark, and buds, pure absolutes and balsams, and pure alcohol (grain or cane) from Australian sources. They’re also all gluten free and non-GMO, and made without artificial and animal fragrances, colors, phthalates, parabens or synthetic ingredients. I tried their sampler pack and blew threw Flirty (a fun and playful scent with fresh citrus notes and a slightly warm green undertone). Expressive was another favorite of mine–it was cool and crisp with sweet spicy notes. Lina Hanson Satori Perfume Oil ($90 for 7.5 mL): This 100% natural, organic, vegan (not tested on animals), handcrafted perfume oil is made with fractionated coconut oil and a well balanced natural and organic essential oil blend. It comes in a roller ball, which I love for easy use and reapplying on-the-go. I found the scent to be at once energizing thanks to the yuzu and ginger, and yet warming and grounding with notes of vanilla and sandalwood. It lasts for a few hours and smells quite strong, as well, though I’ll admit it doesn’t smell as much like perfume. For better or worse, this oil smelled more oily to me (if that makes sense). Osmia Organics Natural Perfume ($75 for 7.5 mL): Cruelty-free, vegan, organic, golden jojoba oil, steam-fractionated coconut oil, and a proprietary blend of essential oils, CO2 extracts, and absolutes make up these natural fragrances–of which Bria (bright and energizing with sandalwood, frankincense, jasmine, clove, pine, spruce and coriander) and Juniper Fire (it smelled like a cool day in the mountains with vanilla, oakmoss, sandalwood, juniper and cedar) were my favorites. While I do wish that Osmia would list their full ingredients on the label, they’re website says, “We don’t list our essential oil blends (we think they’re kinda special and want to keep them that way) but feel free to email us if you have sensitivities and need to know about specific oils.” So, at least they’re transparent if you take the time to ask. They are made without Parabens, Ethoxylated ingredients, Phthalates, Synthetic color, Sulfates, Synthetic fragrance and Petrochemicals, so there is that. Have you tried any of these natural perfumes? I’d love to hear about your results. Share in the comments below! Note: perfume and fragrance is such a personal preference and everyone leans toward different aromas, so my picking Ime as the winner is just based on my preference for light, crisp aromas. 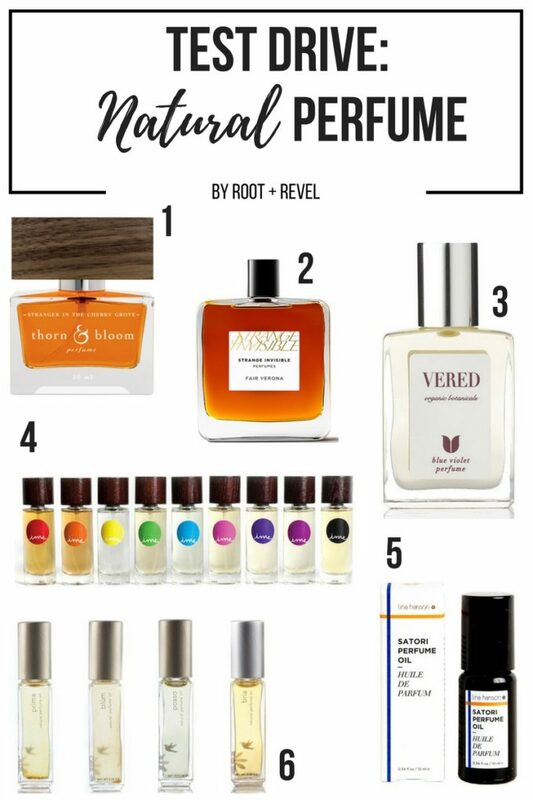 Someone else might prefer something rich and floral (go for Thorn + Bloom or Strange Invisible), while another woman might like something really woodsy and smoky (Vered is for you!). Keep scrolling down to enter our giveaway–you’ll receive tons samples so you can decide for yourself! Though I know most people’s go-to beauty store is Sephora, you won’t find any natural perfume options there. Instead, I recommend shopping on Amazon or over at The Detox Market (one of my favorite natural beauty stores), or going to individual natural perfumier’s websites. 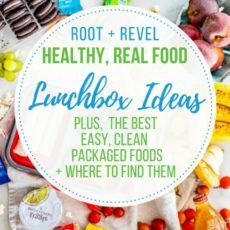 The links listed above will all take you to where you can buy the natural perfumes if you’re interested in trying them out–and almost all of these natural perfume brands sell sampler assortment packs so you can try before you commit to a large bottle. Wherever you buy your natural perfume, just make sure to read the label fully and if you have questions about the origin of any ingredients, what the blends are made from or if anything is vague, don’t hesitate to reach out to the perfumier directly and ask. A trustworthy brand will have no problem sharing the specifics of what goes into their natural perfume with you. If they won’t tell you, run far away! Disclaimer: This post includes affiliate links, and I will earn a commission if you purchase through these links. Please note that I’ve linked to these products purely because I recommend them and they are from companies I trust. Thank you! I have been looking for a substitute for Light Blue for over a year. Which one would you recommend that is most similar? It’s the best, isn’t it? Well, minus all the toxins 😉 So I didn’t find any that are identical, but Ime Natural’s Flirty was my favorite and probably the closest to it. Hope that helps! Thanks, Marcea! 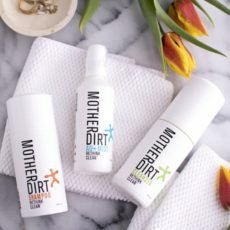 You should definitely check some of these brands out–they smell so good and have none of the toxins!